IIn the low bushes on North Seymour, iguanas crouch without being disturbed by the curious gazes of the visitors. Two types of the flaky and somewhat dangerous seeming lizards live on the Galápagos- Islands: One of it lives exclusively at land, the other type spends a considerable time in the sea. Especially big, bay colored country-iguanas are on the Cerro Dragon - dragon-hills -, to be marveled in the west of Santa Cruz. At the foot of the dragon-hill, some pink-colored flamingos wade around in a small lake. There are other nearly unrecognizable color-swabs: butterflies and small yellow blooms of the tree- wool flower in the hot in the afternoon-sun. "The plants need no splendid blooms for the dusting " Justin says. In the pleasantly warm Pacific-water the visitors find some cooling. If you expect a cool beverage, you have to go back the ship with the rubber dinghy: The dragon-hill is not inhabited, and there are no beach-bars. 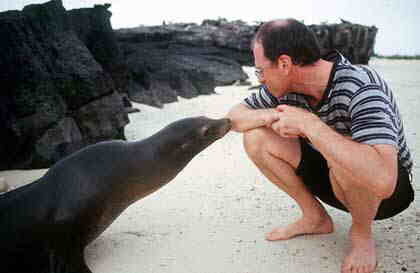 The same happens on the numerous other dream-beaches of the Galápagos- Islands. One of these beaches, lies on the foot of the Cerro Brujo on San Cristobal in the east of the archipelago. Here it becomes very clear that the human being on the Galápagos- Islands plays only a second role: Although the incipient, hilly wilderness lying directly behind the sandy beach invites to a discovery-tour, these are not permitted by the " Park Rangers ". Too big is the danger, that the nests of sea turtles are trampled. Looking at the holes in the sand, it can be imagined that the animals must have crawled here at beach, in order to dig in their eggs. You can not reach the beach at the Cerro Brujo by land, but only through a trip in a rubber dinghy. Many visitor-groups start these in the dawn, because they want to experience one of the impressive spectacles that offers the islands: a sunrise at the Kicker Rock. A few hundred meters in front of the coast, the rock towers into the heaven. In the Pacific water, sea turtles are to be seen - only for a short moment. Near the rock hundreds of birds are to be heard. 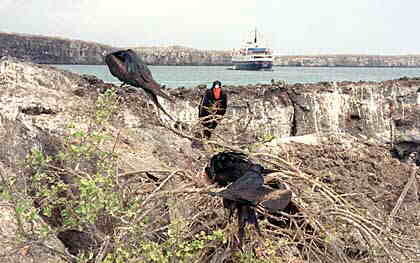 Big streams of tourists don't make it on the Galapagos Islands, too far away located are the islands in the Pacific. However visitors, who dare to make the long way, can delight in untouched nature, iguanas, mighty turtles, thousands of seals and a rich bird-world to observe. Puerto Ayora - the males give shrill sounds, the females strange sounds. The feet of the blue-foot-dolts are even more astonishing however: actually they shine so light-blue, as if they were painted. The duck- type birds populate the Galapagos Islands in big numbers. Also the archipelago is as uncommon as the blue-foot-dolts in the Pacific itself: Although they offer untouched nature and wide sandy beaches, it is no dream-destination in the actual sense. 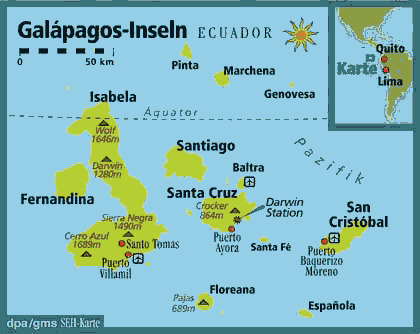 Huge Tourist streams already balk the geographic situation of Galápagos: Approximately 1000 kilometers west from Ecuadorian mainland in the Pacific lain, the islands are to be reached exclusively after a stop in the South American country, to whom they belong. From Quito the capital of Ecuador it takes three hours, until the small aircraft reaches the former military-airfield on Baltra. The word airfield is exaggerated: There is only a shiny runway in the sun with some cottages, there is no more. Immediately after the landing, the visitors are asked to the cash register: 100 U.S. dollars (entrance fee to the National Park). With the money the "Park Rangers" are paid, their company is stipulated at least for tours on the smaller of the 18 islands. Then, you go by the bus to the harbor and there you get to the most comfortable possibility to reach the next island: the cruise- ship of a native or US-American shipping company. Beside the " Celebrity Xpedition " of Celebrity Cruises runs the " Tip Top II " and the " Tip Top III " of Rolf Wittmer Turismo Galápagos, that " Nemo Galápagos " and the " Pelíkano " of Latin tour as well as the " Amigo I " of the operator Galahost, the information- service lists Ecuadorline in Quito. Sea lions swim beside the rubber dinghies, which bring the guests to the ships lying by anchors further away in the sea. The animals, who live in the archipelago in thousands, are by no means the owners of Galápagos – however, at least the big Lions behaves so: On Española, the most southern island, they lie at the boat-landing place Punta Suarez at the beach and move their inertly heavy bodies into the height, in order to yell blood-curdling. That doesn't impress much the females, from whom their breeding suckles. Galápagos Visitors must be well on foot: On the uninhabited islands like Española, there are marked, but not specifically developed paths - Galápagos should remain as original possible as a National-park and Unesco World Heritage. Therefore, you have to balance over rocks or to duck under hanging branches of bushes. However the effort is worthwhile: One of the paths on Española leads to a bay, in which every few seconds a huge water-fountain is hissed into the height, shooting through a small hole in the black rock-ground, - an imposing sight. Also the blue-foot-dolts have their big appearance here: Nervously, a male and a female waddle about each other. With their hissed tail-feather they signal to each other their mutual interest. With their beaks, they lift small branches into the height and drop them again. Then, the two birds beat their beaks clattering together in order to separate abruptly again - apparently however no dream-pair. " The love-act would have lasted only five seconds” explains Justin, a Park Ranger originally from California. Only five of the Galápagos-Islands are inhabited by humans, and only on four islands are some hotels. A big part of the 20.000 natives are living in Puerto Ayora on Santa Cruz. In the bay in front of the town are wooden fisher-boats and yachts in the crystal-clear water. On the small promenade, teenagers ride around with their mountain bikes, there are stores, cafes and one church. Inside the church, it becomes clear to the visitor that the clock runs different on Galápagos Islands: Not one saint adorns the colorful window behind the altar but pelicans. On Santa Cruz, there are asphalted streets. One of them leads through Puerto Ayora into the center of the island. After a few kilometers, the bus turns with the visitors into a small track, then it continues on foot. Goal is a pond surrounded by bushes and trees. Three members of the species from the presumably best known island-inhabitants are lying in the pond virtually motionless: mighty Galápagos- Sea turtles. Before settlers discovered the archipelago in the 16. Century, there were hundreds of thousands of them. Today, only approximately 15.000 are here. Fortunately the following generations of Galápagos Settlers treat the turtles more carefully and had canceled them from their menus long time ago. In Puerto Ayora, there is the “Charles Darwin Research Station ", in which the armored animals are breaded in a controlled way. Again and again, turtles are set free in order to live in the nature. The scientists won't be able to prevent the extinction of a particular type that comes from Pinta, the most northern Galápagos- Island: however, " Lonesome George " lives in their care as the last representative of his kind. The naturalist Charles Darwin came 1835 to the Galápagos- Islands and was fascinated particularly by the bird-variety - more than 50 types lives here. A fink named after him testifies the work of Darwin. These and many others can be observed on the tiny island North Seymour. 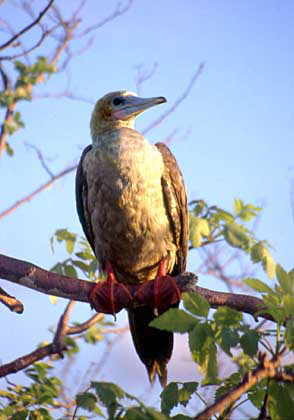 The "Frigate birds" are especially showy with their shiny red throat. North Seymour nature is growing only sparsely, the red rock is sprinkled with white of the removals of the blue-foot-dolts. All the year the sun burns down on the visitors –with hardly changing power, since the archipelago lies directly at the equator.